We looked at the top 1 Tower Fans and dug through the reviews from 3 of the most popular review sites including Top Ten Reviews, Your Tower Fans, Know The Flo and more. Through this analysis, we've determined the best Tower Fan you should buy. In our analysis of 70 expert reviews, the Holmes Holmes Oscillating Tower Fan placed 10th when we looked at the top 10 products in the category. For the full ranking, see below. Checkout Holmes Oscillating Tower Fan for a detailed review of all the top tower fans. One of the best things about this fan is its dual-oscillating feature. While most fans only rotate 90 degrees in one direction and back, you can stop the Holmes fan at any point in its oscillation cycle and reverse its direction with the push of a button on the remote or control panel. This saves you the hassle of having to manually reposition the fan if you want it to blow in a different direction. The oscillation feature of this particular tower fan allows it to cover almost the entire room.Up to 8 hours can be preset on the automated timer, for the tower to respond automatically to switch on/off. There are 2 breeze settings, natural and sleep. Natural is an attempt and creating a natural breeze you might feel outside. It cycles through the fan speeds settings randomly creating and ebb and flow of wind. The sleep breeze setting with cycle through the wind speed settings in order, so from high to medium to low. The cryptic symbols on the remote take a lot of getting used to. Sadly many consumers found the base flimsy and not that well built causing the fan to move around and wobble on the higher settings. Keep cool without cluttering your living space using the Holmes Oscillating Tower Fan. 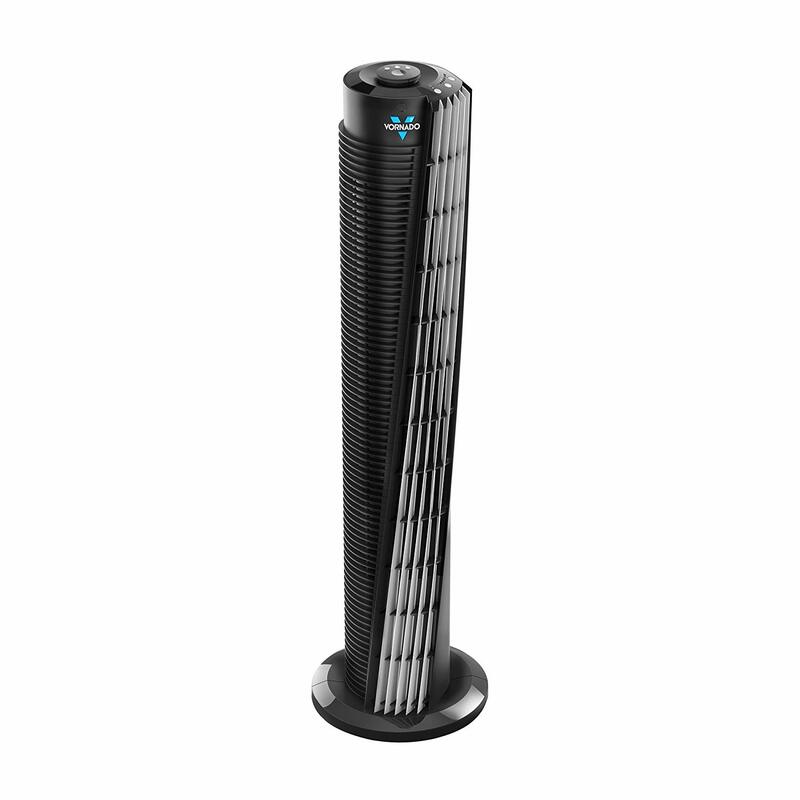 Offering whole-room cooling in an elegant, space-saving design, this rotating tower fan provides refreshing, cool relief from hot and humid weather. The fan operates quietly to help keep distractions to a minimum, and its multidirectional oscillation provides cooling over a wide area. An intuitive control panel and remote control allow you to easily manage fan speed settings, while an adjustable timer lets you program the fan to run for up to eight hours. With its narrow footprint and slim profile, this tower fan is an ideal cooling solution for small areas.